Today the Bureau of Labor Statistics announced the unemployment numbers for the period ending July 2013 broken down into the 372 metropolitan areas. Jobless rates were lower in July than a year earlier in 320 of the 372 metropolitan areas, higher in 38, and unchanged in 14. Forty-one areas had jobless rates of at least 10.0 percent, and 34 areas had rates of less than 5.0 percent. Over the year, 319 areas had increases in nonfarm payroll employment, 48 had decreases, and 5 had no change. The national unemployment rate in July was 7.7 percent, not seasonally adjusted, down from 8.6 percent a year earlier. 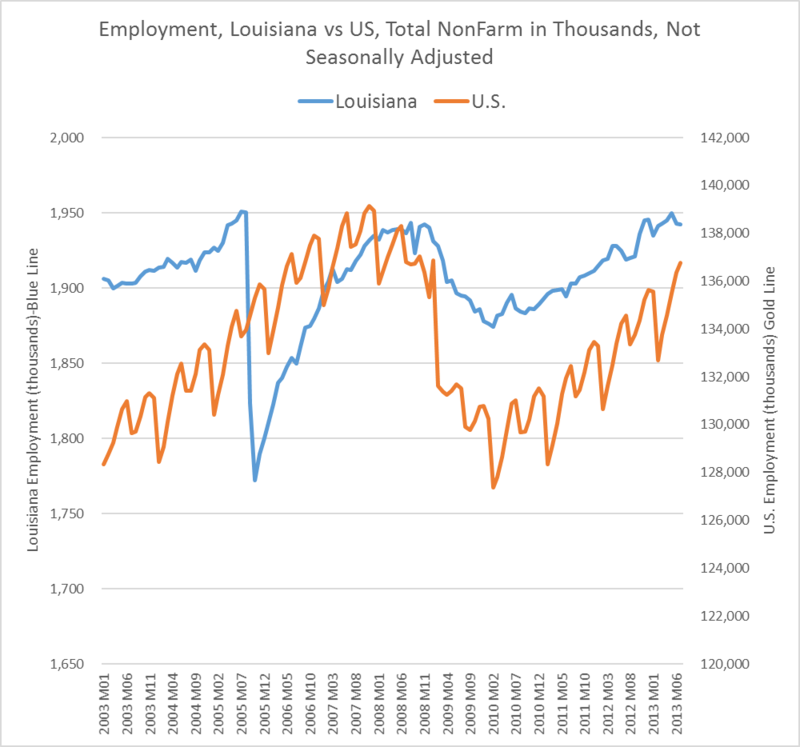 It helps to compare the U.S. employment growth to the Louisiana employment growth and examine a long term view. For additional information, including excel tables and charts, contact Robert Hand at roberthand@cox.net.